Do You Like Your Risotto Poached or Sunny Side Up? I had the best intentions of cooking fish last night. I had to run some errands in the city and would be right by Whole Foods so would be able to pick some up. But like always the day got away from me and afternoon became evening and I knew my plans were foiled. I had some beautiful leeks in the fridge and instantly thought of risotto. But with not much else in the kitchen, I needed some inspiration. I googled “leek risotto” and came across Bon Appetit’s amazing recipe for Bacon and Leek Risotto with Poached Egg. I was immediately in love. I’ve never actually poached an egg before. I’m not sure why. Fear I guess? But I figured, let’s give it a shot. For the first time in a long time I made the recipe almost exactly. I really couldn’t find anything that needed to be added. It was perfect. I did end up using a bit less broth because my risotto just cooked a bit faster, but still suggest using the full recommended quantity. And, since we were serving it as a dinner portion, and were quite hungry, I found the recipe produced 4 servings instead of 6. Super easy and a delicious result. Heat oil in heavy large saucepan or dutch oven over medium heat. Add bacon and cook until crisp, stirring occasionally. Using slotted spoon, transfer bacon to paper towels to drain. Add leeks to drippings in pan; cook until soft but not brown, stirring often, 4 to 5 minutes. Add rice to pan; stir 1 to 2 minutes. Add wine; stir until absorbed, about 2 minutes. Ladle warm broth into pan, just enough to cover risotto; stir until broth is absorbed. Repeat adding broth and stirring until rice is tender but still firm to bite and sauce is creamy, stirring almost constantly, about 23 minutes total. Add bacon, chopped parsley, butter, and 2 tablespoons cheese. Season to taste with salt and freshly ground black pepper. Meanwhile, bring a large skillet of water just to simmer over medium-low heat. Sprinkle water with salt. Working with 1 egg at a time, crack into small bowl and slide egg into simmering water. Cook eggs until whites are cooked through but yolks are still runny, 3 to 4 minutes. 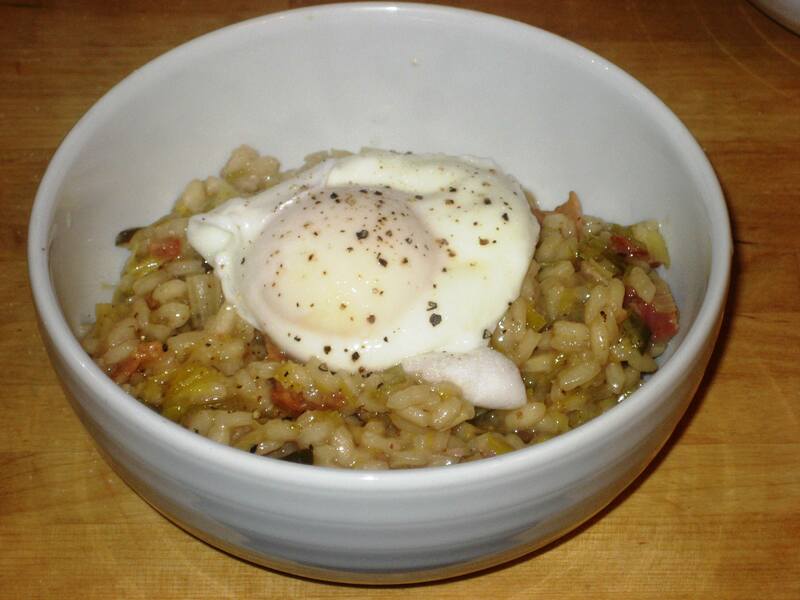 Using slotted spoon, top risotto in each bowl with a poached egg. Sprinkle egg with salt and pepper. Serve immediately. I don’t know what it is but I adore dishes that are topped with eggs. Leeks and bacon and eggs? yum! Risotto! It’s like a creamy rice dish with bacon, leeks, butter and cheese. Thanks for the feedback and site! I definitely need to reference this in the future!